Sizes are in inches, but supplies are in both imperial and metric - actual garment measurements: Chest: 18 (20, 22)” - Length: 9½ (11, 12½)” (length and sleeves are easily adjustable). 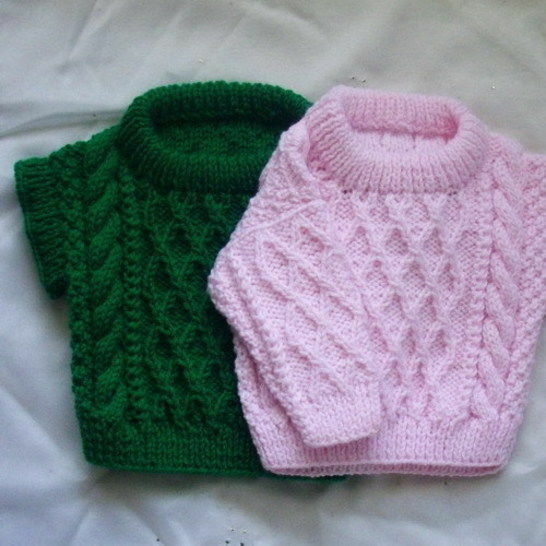 A little sweater for baby or toddler – make it with sleeves, or as a sleeveless pullover to slip on over another top for an extra layer of warmth. Suitable for boys or girls. There are four pages to the pattern, with written instructions and photographs. Worsted yarn was used for the pictured garment, you don't need to use the yarn specified as long as you make sure that you check the gauge. The garment is knit flat, so only straight needles are required. Actual garment measurements: Chest: 18 (20, 22)”. Length: 9½ (11, 12½)” (length and sleeves are easily adjustable). Suitable for experienced knitters. You will need: * 3 (4, 5) oz. any soft medium yarn which will give the gauge. * The pink garment in the photos was made with Red Heart Comfort yarn - http://www.redheart.com/yarn/comfort/light-pink; and the green garment was made with some left-over regular worsted which gave a firmer fabric. * Straight knitting needles, sizes 4.5 mm (7 U.K., 7 U.S.) and 3.75 mm (9 U.K., 5 U.S.) * Cable needle * Stitch holders * Yarn needle for sewing up.